Get started on your workshop, wood shop, auto restoration garage, hobby shop, home office or backyard studio. With one order for just $29.00 you can download construction blueprints for dozens of designs - all of the designs that you'll find on this page and more. You'll be able to download any and all of the plans right away and print as many copies as you need to get permits, to get contractors' bids and to build your shop. Orders are processed by PayPal. Their secure, quick checkout accepts all major credit cards. Click on the titles to learn more about any of the designs and and to see floor plans and larger illustrations. Workshop, Studio and Hobby Shop Plans This attractive, gable roof workshop garage has double hinged doors and an 8' wide overhead garage door on the front. That makes it perfect for moving materials in and big projects out. It's also a makes a great combination garage and shop for small vehicles. Plans available here let you build your workshop in any of four different sizes: 16'x24', 16'x30', 20'x20' and 20'x24'. 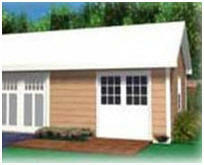 The two workshops with 20' depths will fit full size cars, SUVs, tractors and small trucks. 14'x20' Plans for a Backyard Cottage, Office, Shop or Studio This attractive little building would make the perfect pool house or cabana, but you could also use it as a backyard office, studio or guest cottage. The forty-five page plan set that you can download includes framing plans, sections, elevations, a roof rafter isometric, a materials list and all of the details that you'll need. 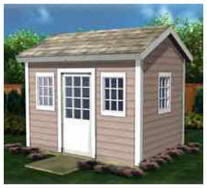 10'x16' All Purpose Shop or Shed This practical and pretty little building design would make a great all purpose tool, storage or garden shed in your backyard. At 10'x16 it's perfect for a backyard art or craft studio or home office. The Oak Lawn Car Barn and Workshop Plans Build any of a dozen different layouts of garages and workshops with the help of this set of plans. 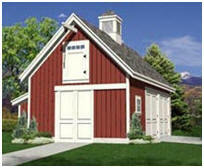 You can build the 24’ wide Two-Car Main Garage at 24’, 26’ or 28’ depth and add Expansion Sheds to either or both sides. Use the Expansion Sheds for more cars or as your workshop space or storage areas. These plans are for conventional stud-frame construction. The Oak Lawn Three-Car Garage and Workshop This Coach House Style three-car garage has a extra 12' wide workshop or storage area. It will look great behind an old house or in a traditional neighborhood. It's perfect for keeping, restoring and maintaining classic automobiles. There's a big, walk-up loft for more storage of for use as a home office. 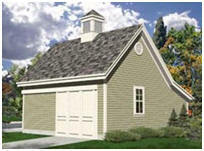 Candlewood Car Barn and Workshop Build this little, all-purpose pole-frame building as your shed, garage, tractor shelter, workshop or backyard studio. It has a parking area for a car, small truck or yard tractor, an extra area for a workshop and tools and a convenient storage loft. 12'x16', 16'x20' and 16'x24' Mini-Barn Plans This pretty little barn-roof shed has double doors so you can drive your lawn tractor, ATV or snowmobile right in. Building plans are available here in three different sizes: 12'x16', 16'x20' and 16'x24'. Those are all big enough for this to be your backyard studio or hobby shop too. Backyard Cottage You can use this pretty all-purpose building as your shed, backyard office, studio, cabana, pool house or guest cottage. Skylights make the interior a bright and comfortable space. The construction drawings call for 2x4 walls, 2x6 roof rafters and a monolithic slab foundation. Exterior finishes are up to you, so you can match the appearance of your home. You can click on the illustration to see the floor plan. 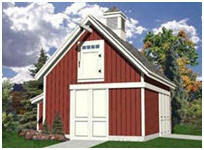 Woodberry Pole Barn and Workshop Plans Build this small, all-purpose building as your storage barn, garage, equipment shelter, workshop or backyard studio. It has parking spots for two cars or small trucks, an extra area for a workshop and tools, and a storage loft with a convenient outside door and lift post. These plans are for pole-frame construction. Garden Oak Garage and Workshop Plans Build any of a dozen different layouts of garages and workshops with the help of this set of plans. 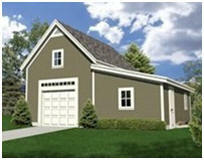 You can build the 24’ wide Two-Car Main Garage at 24’, 26’ or 28’ depth and add Expansion Sheds to either or both sides. Use the Expansion Sheds for more cars or as your workshop space or storage areas. 28'x46' Open Plan Shop. This design is suitable for an RV, up to four cars, or for use as a big, open plan workshop. The Oakville Garage and Shop Plan Set All of the projects around your place would be much easier if you had a sheltered place to work, with room for all of your tools and work tables and storage space for your supplies. You need a workshop. And, you can get started on one right now with these plans. 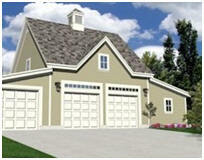 The Oakville Workshop is a practical one-car garage with a storage loft and a 12'x24 shop area at the side. It's perfect for auto restoration or car care. But, the big overhead garage door also makes it work well as a woodworking shop if you're planning on building large projects. Woodberry Pole-Frame Garage and Workshop Build this small, all-purpose pole-frame building as your storage barn, garage, equipment shelter, workshop or backyard studio. It has parking spots for two cars or small trucks, an extra area for a workshop and tools and a storage loft with a convenient outside door and lift post. 10'x12' Cabana Shop This little building would make a great storage shed. But, it's attractive enough to be your pool house, backyard guest cottage, studio or home office. The thirty-three page plan set that you can download includes framing plans, sections, elevations, roof rafter cutting diagrams and all of the details that you or your contractor will need to build it. Candlewood Garage and Workshop Build this little, all-purpose pole-frame building as your shed, garage, tractor shelter, workshop or backyard studio. It has a parking area for a car, small truck or yard tractor, an extra area for a workshop and tools and a convenient storage loft. 8'x12' Playhouse, Garden Shed or Backyard Studio Think of all the fun you kids will have with this little building as their playhouse. Then, use it as your garden shed when they outgrow it. Or, add side windows, as shown above, for a bright backyard studio or mini home office. The plans cost $29.00 and are delivered instantly by a link to an easy-to-use web page with construction drawings for all of the buildings shown above and for a variety of other garage, barn and shed designs. In all, you'll be able to build any of more than one hundred different building designs, layouts and sizes. You'll also be able to download any and all of the plans and print as many copies of each as you'd like. The plan set comes with a complete money-back guarantee. Your plans come with a complete money-back guarantee. Order them and review them for as long as you want. If they don't meet your needs, for any reason, just return them for a prompt, complete refund. We are proud of our plans, of our guarantee and that we've been a PayPal Security Verified Merchant, continuously, since June, 2000. Your order will be processed by PayPal's quick, secure checkout which accepts all major credit cards. Have all blueprints reviewed by your building department or by an experienced building professional who knows local conditions, before you purchase materials or start to build. These plans may have to be modified by a local professional to suit your site's building code and weather requirements.